How can we make our drum kit quieter? 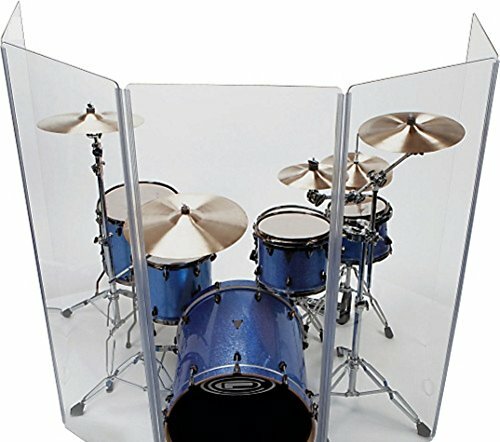 What is the purpose of a drum shield? Pastors and church leaders have a love/hate relationship with drummers. We love the fact that they are helping make the worship experience more relevant and modern. We love that they are using their gift in the service of the Lord. We love them as fellow followers of Jesus. However, at times, they make our life rough. When a drummer overpowers the room that they are playing in, nothing is more distracting to the worship experience. And nothing makes a pastor or church leader, or sound technician sigh more when they start getting complaints from the congregation. 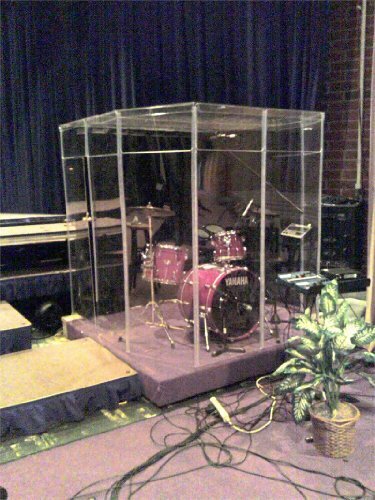 There are many solutions to this problem, including placing a drum shield around the drum kit on your church stage. I will cover the solutions and offer up to you some drum shields that will work well for your church congregation. 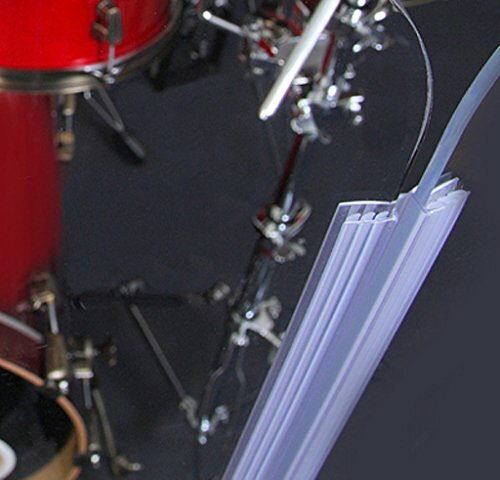 There are many ways to make your drum kit quieter. However, not all of them will do an adequate job of dampening the sound of the drums enough for some sanctuaries. Those methods include…..
Use pillows to muffle the bass drum. You can stuff a couple of throw pillows or bedroom pillows in the bass drum to dampen the boom in the bass drum sound. Purchase low volume cymbals. You can purchase a set of Zildjian low volume cymbals. These are perforated which causes them to have a lower volume level. Use low volume mesh heads like these from Pearl. Mesh heads are weaved polyester heads instead of a solid sheet of polyester. The result is a softer sound level. Have your drummer use brushes or hotrods. Brushes have been around for a long time. They are used in big band and jazz groups all the time. Hotrods are a combination of a drum stick and a brush using small dowels. These will keep your drummers stroke light. However, there have been complaints that they break easily. Invest in an Electric Drum Set. This is my personal favorite option. This allows the drummer to play as hard as he wants while the soundman has total control of the drum volume. It is as close to a win/win situation that you can get. 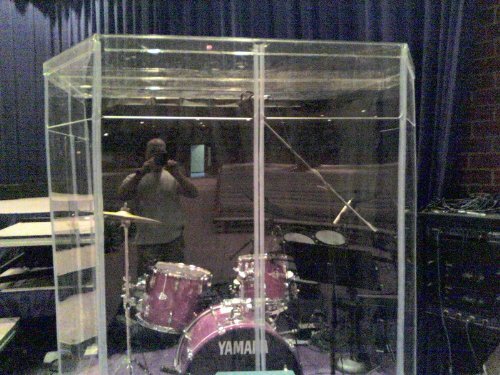 A drum shield is a transparent physical barrier between the drummer and the rest of the stage and congregation. It reflects the sound back at the drummer and the back of the stage thus reducing and deflecting the sound that goes towards the rest of the sanctuary. Its primary purpose is to decrease the sound level of the drum kit. However, it has a secondary benefit as well. Having spent many years as a bass player standing next to drummers, I have on more than one occasion been beaned in the head by a flying drum stick that flew out of the drummer’s hand. 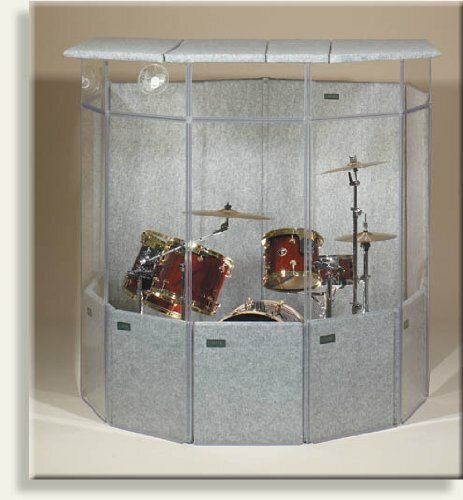 A drum shield also serves as a safety shield for those on stage and even in the audience. I would be remiss if I didn’t speak for both sides of this issue. I am in a unique position having been both a professional musician and a pastor. Both the drummer and the congregation have needs. The congregation needs to be able to worship without distraction or discomfort. There is something special that happens when a congregation hears each other sing to Jesus. However, most drummers are not trying to be a distraction. They want to help the church in their worship of Jesus. However, they also want to sound the best that they can. Just like any pastor wants the PA system to make him sound good as well. Mesh heads, hotrods, brushes, and pillows in the drums degrade the sound for certain types of songs. It would be like putting a muzzle over the preacher before he was to give his sermon. 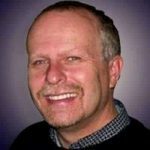 There are needs on both sides and the needs of the drummer should be just as important as the needs of the congregation. Remember Jesus left the 99 to go after the 1. With that said, I will now give you a great option for meeting the needs of both. Drums shields have been around longer than electronic drums. I am not a drummer, I am a bass player. So my thoughts about electronic drums are skewed towards what works for a pastor. There are many drummers who prefer to play an acoustic drum set rather than an electronic set. I can understand that. 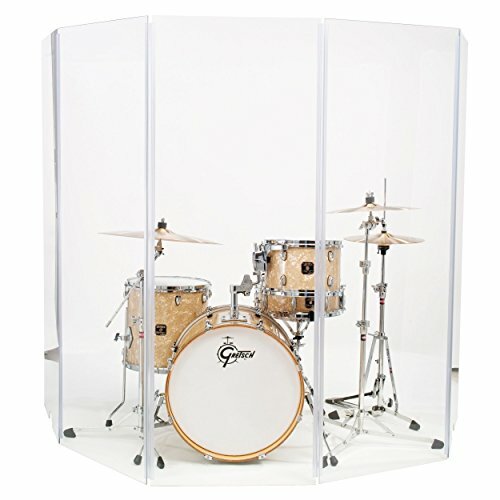 Because of their preference, the only good option to reduce the sound level is a drum shield. 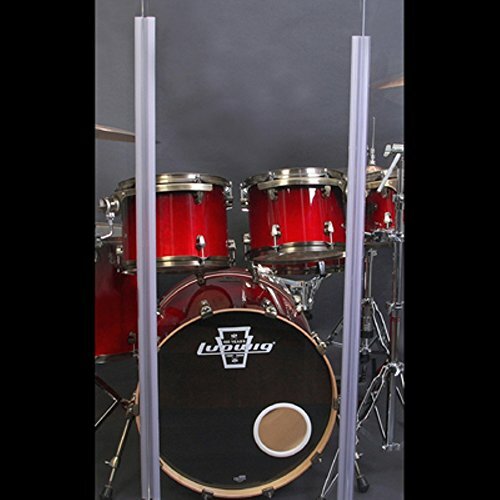 Drum shields come in a wide array of price points and effectiveness. You can spend a few hundred bucks to thousands. I will give you 3 choices to help you decide which is best for you. 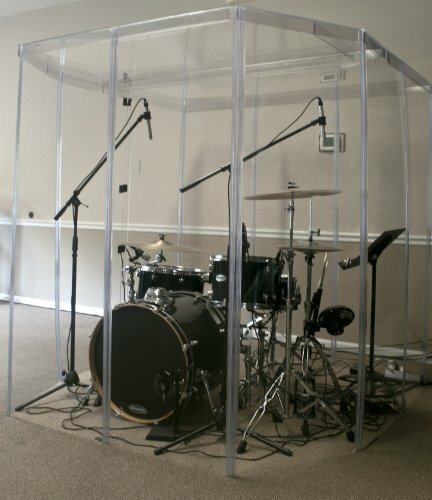 The best drum shield for actually reducing the decibel level of the drum set is actually what I would call a drum isolation chamber. 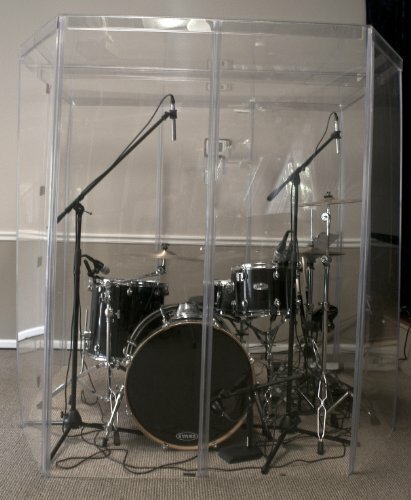 The drummer is not only surrounded by plexiglass but has soundproofing around most of the kit. Needless to say, this is not an inexpensive option but you will see a reduction of 50-60 decibels of sound coming from the drummer. Three S5-2 SORBER baffles in the rear. Seven S2 SORBER baffles are attached to the inside lower portion of the acrylic panels. 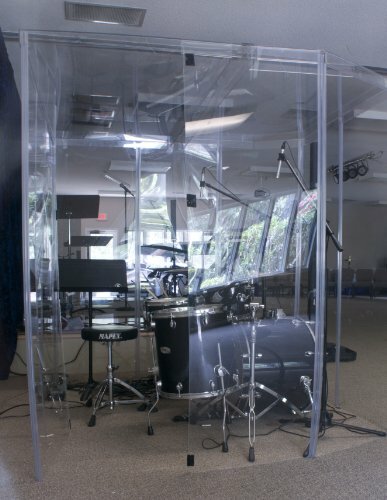 The clear panels are a total of 6.5' tall, and the S5-2 baffles are 5.5' tall, so there is a foot of open space around the rear of the booth allowing for air exchange. 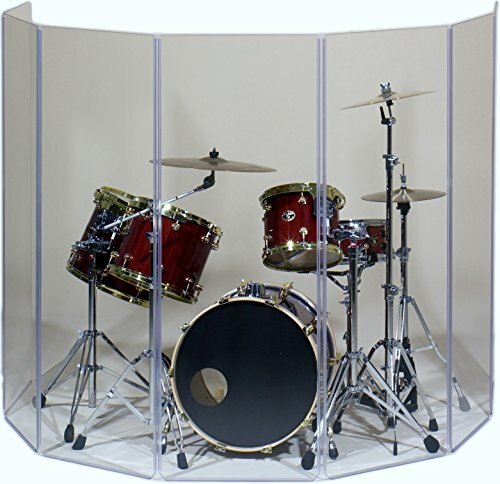 For a plain Jane drum shield, this one has the added benefit of being 5 foot tall which gives extra protection to those on the stage and in the congregation. However, it does not come with any sound absorption panels and is open backed so will not cut down the sound as others will. Yet if you are on a budget, this one fits the bill. I have tried to balance quality, sound reduction, and price in coming up with this drum shield. I am a firm believer in being a good steward of the finances God has given us, yet also knowing that you get what you pay for. I believe this is a happy medium between the two. If you need this item sooner than the Estimated delivery date please give us a call first 269-651-9975. MADE IN THE USA , If shipping to NYC we will have to charge and extra $155.00 for shipping due to special trucking in NYC, Long Island, Brooklyn and surrounding areas. For shipping out of the Continental USA please call or email for a quote on shipping. 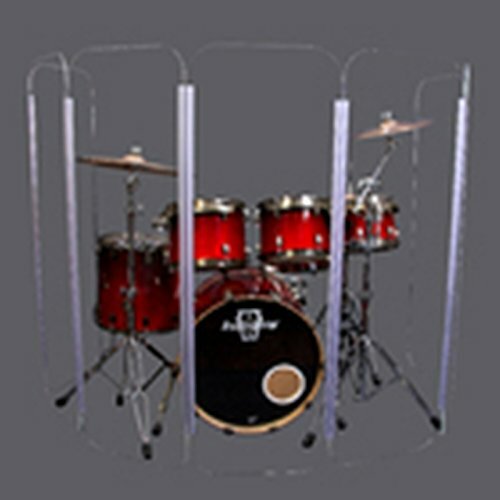 If your drum set is always located in the same place Drum shields are not the best alternative for musicians and bands that travel. If your worship teams use in-ear monitor systems. The rest of your worship team will be able to hear their monitors better and it will sound better to them as well. When your congregation wants to hear themselves sing and the drums are overpowering the room. Lower stage volume for your worship team. 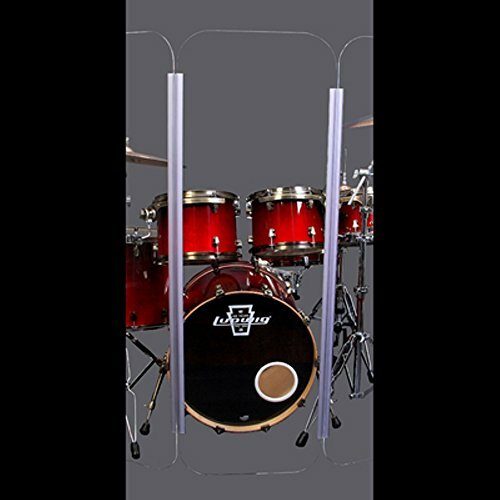 Even with the cheapest drum shield, this will help the rest of the team hear their instruments and monitors. Cleaner mix for your sound system and your sound engineer to use. Drums are notorious for bleeding into every other microphone on the stage. With a drum shield, you cut this problem down drastically. Happier singers onstage and off. The drummer will experience higher volume levels. However, this might be a good thing. He won’t feel like he has to play louder. If you use stage lighting, then it will be more difficult to light the drummer and drum kit. There will be diffraction and diffusion issues. Cheaper open backed shields will not be as effective. Although they will offer protection and some sound reduction, if you expect a cheap shield to solve all your problems, you will be disappointed. 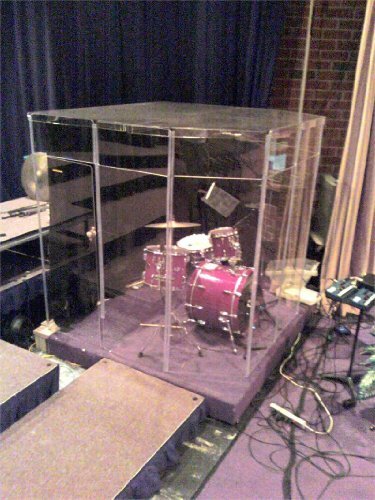 For those of you that have a plethora of handymen in your church, you have the option of building your own drum shield. However, you should be aware that this may not be a way to save money. I recently checked on plexiglass at Home Depot. A 4’x8′ sheet of plexiglass costs over $100.00. However, if you think this might be a fun project for a group of your people at church then you may like this video. 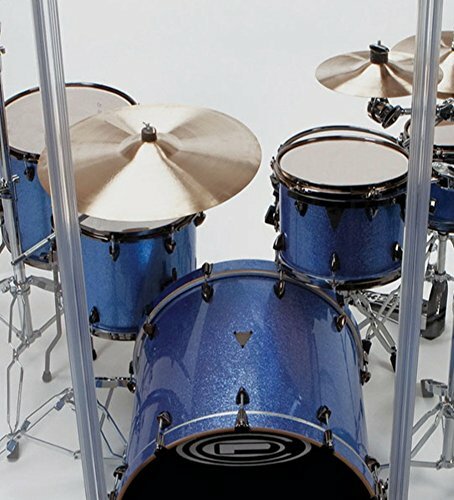 Well, I hope that this article has helped you decide which drum shield option is best for you. I am sure there is a solution that will work best for your pastor, church leadership, congregation, and your drummer.